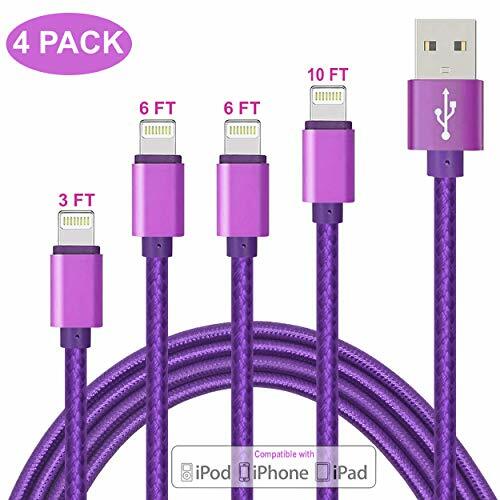 Color:Purple/3ft/6ft/6ft/10ft Color:Purple/3ft/6ft/6ft/10ft Extra durability,8 pin Lightning Cable with anti-resistant aluminum alloy connectors, 100% compatibility to transmit data stably and charge fast without error messages,The other nice thing about this the cable is very pliable and more like string than wire, it is not stiff like the hard plastic cable which makes it easier to coil up and put in your bag.When you are in the car, home, office or outdoor can be used at any time,Small head works fine with most cases,The ultra-compact Lightning cable is not only small enough to perfectly fit most device cases, but it’s also strong enough to withstand repeated unplugging and storage.Nylon Braided Lightning to USB A Cable features high-quality copper wires that maximize signal quality and increase durability. Instead of plastics or Polycarbonate, the cable uses a unique nylon fiber cloth for its protective cover. Wound tightly around the cord, the high-tensile nylon fiber cloth offers superior strength and a bit of flexibility. Even more, the braided nylon is waterproof and can handle daily stress, ensuring long-lasting performance. For complete charging and syncing, this cable works with Apple devices that have a Lightning port, including the iPhone X, iPhone 8, iPhone 8 Plus, iPhone7, iPhone7 Plus, iPhone 6s, iPhone 6, iPhone 6s Plus, iPhone 6 Plus, iPhone SE,iPhone 5C, iPhone 5S, iPhone 5, iPad Air / Air 2, iPad mini / mini 2 / mini 3, iPod nano (7th generation), and iPod touch (5th generation). It’s compatible with the latest iOS 11. Super practical length: in bed, in car and some other places. The bundles of the Lightning to USB Sync and Charge Cable make your life more convenient.